In all its beautiful and vibrant bounty, agriculture is a natural and enduring subject for artists, a real feast for the eyes and imagination if you will. 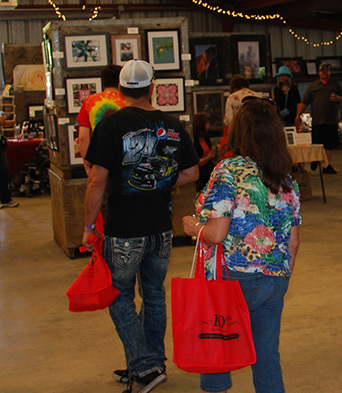 Not to disappoint, guests to the California Nut Festival will enjoy perusing a special art barn display that features amazing works by many talented local artists who are proud and excited to present their artwork at the festival. Of course, the California Nut Festival is committed to connecting the community with farmers, growers and producers in the North Valley but it has also been the driving force in making a connection between agriculture and the fine arts of our community. So while you are enjoying the wonderful variety of foods and beverages on the historic and beautifully manicured grounds of Patrick Ranch, please stop by the Fine Arts Barn where local artists and artisans will be displaying and selling their works. There will be a variety of paintings, photographs of local landscapes, jewelry, lathe wood turned items and pottery. It is sure to whet your appetite for more! Io Bonini Design "Free Range Artist"
Our goal is to grow flax, process flax and create unique fabrics using this quality material. During the California Nut Festival we will be demonstrating the processes involved in the making of linen from braking to weaving. There will be a Seed To Shawl demo where spinners will spin and a scarf will be woven with our locally processed flax during the day. There also will be a display of linen products from family heirlooms to modern linen textiles.